CHATT TOWN, BIG EASY TRIPS AND WHAT’S THAT STAND FOR? I must apologize for this this installment being late. Dad had to take a catering gig yesterday that translated to a 5:30 AM to 2pm work day and a new appreciation for people who work in the service industry on a regular basis. Y’all work hard. As always, we have a lot of ground to cover. So lets get after it. Bruised by years of doing battle with Memphis and Nashville, the Tennessee Department of Education is now turning it’s attention to Chattanooga to try and implement some of it’s not so cutting edge plans. At the forefront of this focus is the creation of a “partnership zone” made up of 5 chronically under-performing schools. As part of the “partnership zone” these schools would be governed by their own school board and receive additional resources. This wouldn’t be a state takeover as Chattanooga and the state would work as partners. Of course the state has an interesting definition of partner. They have given Chattanooga till the end of August to decide if they want to be partners or else they’ll give one or more of the schools to the state Achievement School District. They’ve also failed to share a proposed budget or test scores for the schools from this past year. It’s also worth noting that all of these schools suffer from high poverty levels and this past year the state changed its method of counting Title 1 qualification to including only those children who receive direct services. That means a drop in the official poverty numbers, though not real poverty numbers, and therefore less Title 1 funding for schools with high concentrations of poverty. Somewhere Don Corleone is smiling. Chattanooga has a brand spanking new Superintendent and it appears that he is not in a hurry to join this budding partnership. Not surprisingly he’d like an opportunity to develop his own strategy. The “Partnership zone” is not the only potentially new district coming to Chattanooga. Signal Mountain is looking to exit Hamilton County School District and form their own school district. Signal Mountain is home to 3 of the districts highest performing schools and their exit would have a profound effect on HCSD. Last month town leaders visited Shelby County Schools to get some insight on how the exit could be executed. Watching these developments in Chattanooga is important because I think you’ll see emulation in the rest of the state. Remember in order to do the “Partnership District” legislation permitting schools to be overseen by an appointed board would have to be passed. That legislation alone could have dire consequence for schools across the state. Always be wary of laws that are puportedly designed to help someone because seldom are the unexpected consequences considered. Just look at the ASD. That was never meant to be a charter school zone. Speaking of our friends over at the Tennessee ASD, they’ve got a new leadership team heading into a new school year. Well kinda. Malika Anderson will remain in charge and two of those promoted have been a part of the work since 2011, but there are 2 new lieutenants who are completely new to the district. The leadership change is a shift away from outside education “reformers” and towards people more entrenched in the Tennessee education community. Schools also now won’t suffer the abrupt takeover actions that were the previous hallmark of the ASD. Going forward struggling schools will have three years to apply their own turn around strategies before being eligible for state take over. Over in Maury County, there is a new number 2. Dr. Ron Woodard is the new Assistant Superintendent of Instruction. Many of you may know Ron through his many years as an educational leader in MNPS. A big congratulations to Dr. Woodard. 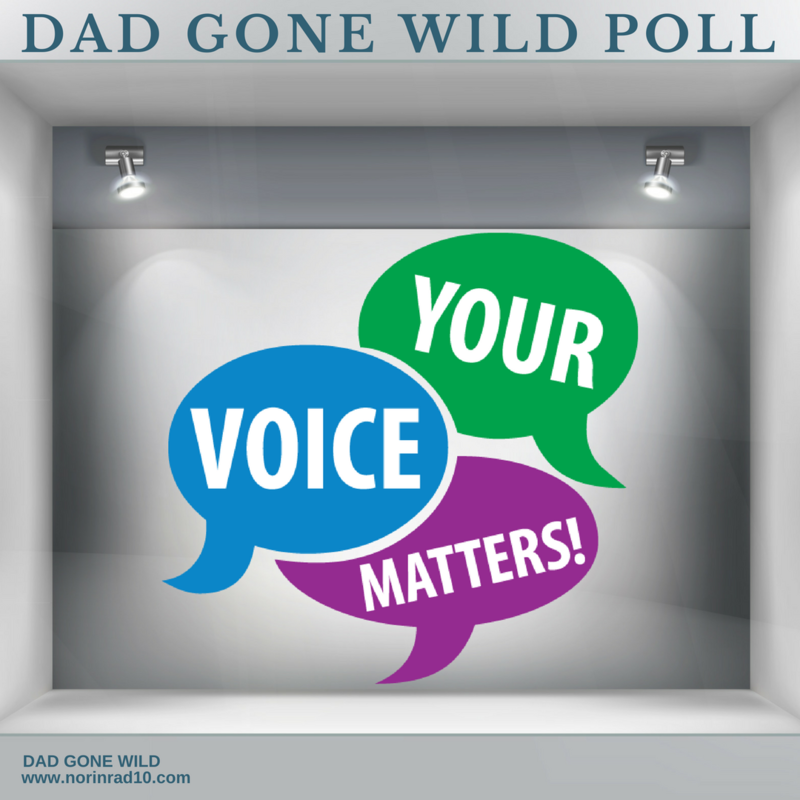 This isn’t part of this week’s poll questions, but I’d like to pose this question to you, what would you do if you were the brand new literacy director to a large urban school district and school was starting in 2 months? Would you a) spend the time reviewing the district’s literacy data and policies, b) get to know in depth the individual literacy coaches that you’l be supervising or c) pack your bags, grab some lead literacy coaches and head to New Orleans for a conference? Well since this is Nashville and our district leadership has yet to meet a trip or consultant they don’t like, the obvious answer is C.
That’s the choice new district literacy director Barbara Lashleymade last week. 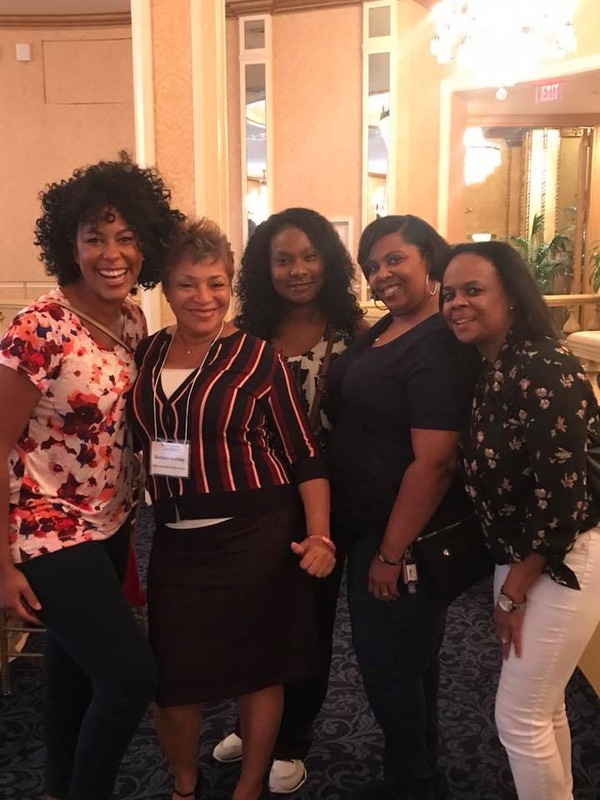 She joined district lead coaches for a fun filled week in the Big Easy for the Equity in Motion Practitioner Convening. The theme of this event was Growing All Students Through High-Quality Assignments. A quick glance at the agenda shows that speakers include Louisiana State Superintendent of Education John White and U.S. Secretary of Education John B. King Jr. In case you are not familiar with John White I suggest you read Mercedes Schneider’s blog posts looking into his work. To call him controversial would be an understatement. Attendees of the conference stayed at the Waldorf-Astoria. Lashley is formerly/currently employed by Scholastic inc so we shouldn’t’ be to surprised. Remember these are the same folks who threw a literacy conference at Amelia Island. Here’s what get’s me though, we don’t have money for hiring the 12th EDSSI but there’s still plenty of money for week long stays in the French Quarter. We preach to kids on a regular basis about setting priorities, yet here we go again. Just remember it was the Mayor’s fault we had to scrape for those 3% raises for teachers. The Board shall strive to evaluate the Director twice annually. Each January, following the mid-point of the school year, the Board will administer a formative evaluation of the Director based on factors including but not limited to formative student assessment data. Each June, following the end of the school year, the Board will administer a summative evaluation of the Director based on factors including but not limited to summative student assessment data, as well as student and educator culture/climate survey data. The formative and summative evaluation instruments will be determined by the Board’s Director Evaluation Committee. In January there was a little cheer circle where everybody stood around and gave a big ol “atta boy”. Dr. Joseph was given a rade of an A. (Just for the record a formative assesment is not supposed to have a grade or numerical score attached. It’s a sumative that gets the score.) Well it’s now the end of July and no evaluation has been completed or is one in sight as far as I can see. This is nothing new because for the last 2 years the board has failed to complete a formal evaluation of either Dr. Register or Chris Henson – the directors prior to Dr. Joseph. That failure came under the guidence of now vice-chair of the directors evaluation committee Sharon Gentry who was chair of the committee. Looks like new committee chair Will Pinkston is picking her work up right where she left off. Which begs the question, why have policy if you are not going to adhere to it? At the last board meeting, Pinkston wasn’t in attendence, but he did pass on information to board chair Anna Shepherd that the committee had not settled on an evaluation tool but was continueing to research. Fair enough, but the policy was written 7 months ago by Pinkston. That should provide ample time to settle on a evalauation tool and conduct an evaluation of the director in a timely manner. What’s Pinkston been doing since the board adopted the policy. He’s conduct a number of charter school investigations, appeared on TV talking about civil rights issues, he’s written an op-ed piece on the failings of others, he’s worked on getting people fired from their jobs, and he’s engaged in several online battles with people he percieves as not being true Democrats. What he hasn’t done is complete the task that he set out for himself. It has to be noted that this is a task that was not imposed on him but rather one that he designed. We often lecture kids about the importance of setting priorities, so how is this modeling that lesson. We tell kids evaluations are an important part of learning but apparently not for those in positions of leadership. Last I checked, my boss never finds it acceptable when I chose to focus on my personal agenda instead of the job prescribed. But then again Pinkston never does seem to think the rules apply to him or that his constituents are his boss. His response to me when I criticized him for the lack of forsight shown by the district in regards to the solar eclipse was a recommendation to “avail yourself of the many charter options available if you don’t like MNPS”, i.e love it or leave it. You know who else talks like that. His recomendation says it all and I’m sure we’ll get a directors evaluation when he’s good and ready. 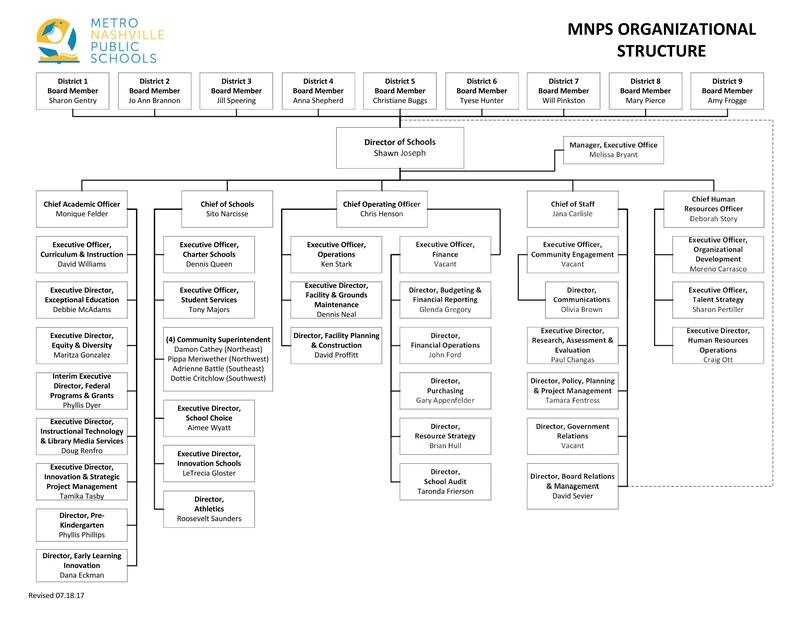 In other news, MNPS has released the beginnings of an organizational chart. There is still a lot to fill in, but it’s a starting point. There are some questions that need answers. Where is the ELL Department on this chart? Gloster is listed separated but in other literature she’s listed in with the EDSSI’s. Which is it? How many total people are in Central office? How many people does Tasby supervise? How many people does Gonzales supervise? Hopefully some of those answers will be forth coming. As it is this chart does little to give a complete picture of what’s going on throughout the district. Here’s it is if you haven’t seen it. The Tennessean has an article on the District’s efforts in regards to teacher recruitment and retention. I’ll let you decide about how effective it’ll be but I would suggest they read Peter Greene’s thoughts on teacher recruitment and rentention as a starting point. As a side note, I am hearing that you can add Maxwell ES to the list of MNPS schools suffering from chronic teacher turnover. The Bellevue Middle School Family will be holding their “Mighty Owl Welcome” for new 5th grade families. It is August 3, Thursday from 4:30-7 PM. All the info you need is on face book. Should be very informative. 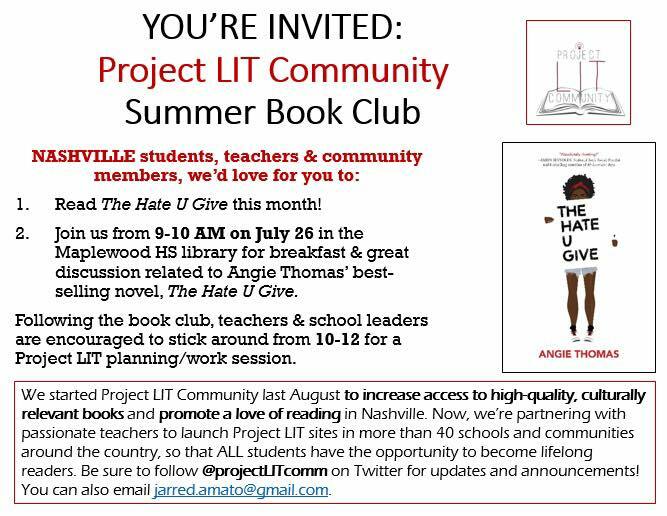 There is a Project Lit book club meeting this week. It’s July 26th from 9-10 AM at the Maplewood HS Library. This month’s book is The Hate You Give by Angie Thomas. Word has it that both Matthew Nelson and Dr. Russell Young are off to good starts at Eakin ES and West End Middle Prep respectfully. Tusculum’s ES has a new AP, Chris Holmes, that has hit the ground running and we are excited to have him. I also hear good things coming out of Maplewood with Dr. Keely Jones-Mason returning. Any idea when they are going to take the title “acting” away from her? I want to have a little fun this week-end. The district has gone a little acronym crazy heading into the new year. Which can make things a bit confusing. I’m going to give you three of the leading new acronyms and we’ll see if you can tell me what they stand for. If you are not sure what they stand for, feel free to follow the districts lead and just make one up. I can’t wait to see the creativity. Let the games begin. All I really care about right now is Total Solar Eclipse Day. I am a teacher and made plans to take my MNPS grandkids to an educational day at a state park. I have bought tickets. I don’t make much money and the tickets were expensive for me. I do not want to spend the day inside my airless/windowless classroom. I am asking for the day off. I also have family coming in from out of town. I made my plans months ago when the day was approved as a PD day. I am sick that the School Board can make a calendar change at a moment’s notice. School Board reps are saying that they made this change for Mayor Barry. Why? Is it to keep MNPS kids off the street so tourists can come in? Why doesn’t our School Board stand up for teachers?